We have had the chance to work with Jeff Gibson of Sound Travels DJ twice now, at Bethany and Jerrod’s wedding, and at Katie and Aaron’s wedding. He is absolutely the best of all the dj’s we have come in contact with! The dj can really make or break your party. On occasion, we have worked with dj’s who didn’t seem to get the memo that the party wasn’t about them. Jeff is ALWAYS about the couple! 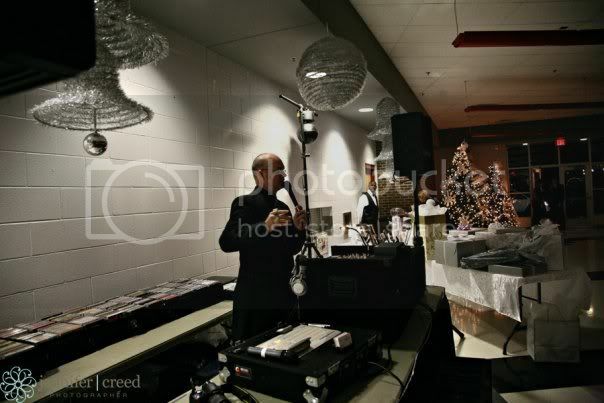 He also is a true professional, licensed and insured, and a member of the American Disc Jockey Association. One of our favorite things about him (other than how fun he is!) is how organized he is! We always know exactly when the first dances will be, when the cake cutting will be, etc. It’s so wonderful to work WITH other vendors, instead of feeling like you’re butting heads! Besides all that…he’s super fun! He keeps the party moving whether it’s rocking it out, or doing some slow dancing. Jeff is located in Lexington, Ky, but is available for travel! Wendi Riggens - I am loving the vendor spotlight idea. I might have to borrow it, Jenny!